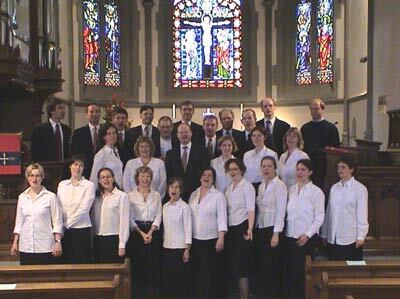 The Embassy Singers is a Berlin-based chamber choir specialising in music by English-speaking composers. Our repertoire covers everything from 16th century madrigals and motets to spirituals and songs from the shows. We draw our members from the international diplomatic community in Berlin and other English-speaking residents of the city. 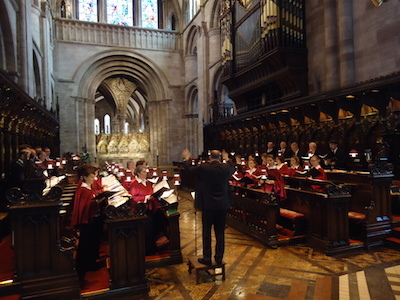 The choir has a busy and lively schedule of performances. It puts on several major concerts a year and participates in church services and other high-profile events. The venues for its performances are as varied as its repertoire: it has sung in many of the major churches in Berlin, such as the Berliner Dom and the Kaiser-Wilhelm-Gedächtnis-Kirche, as well as in the embassies and the Schauspielhaus; it has taken anthems to Tegel Prison and Christmas carols to Bellevue Palace; and it gave a midnight welcome to the ten new EU member states with folksongs and "Ode to Joy" at the Brandenburg Gate in May 2004. It has since featured on BBC Radio 4's "Today" programme and on Hungary's Kossuth Rádió. We also venture outside Berlin: for example, we have sung concerts and services in Hamburg, Erfurt, Dresden (annually in the Frauenkirche), Quedlinburg, Leipzig and Uelzen; our trips abroad have taken us to Vienna (St. Stephen's Cathedral), Zurich, Budapest (Mátyás-templom), Bristol Cathedral and Rome (S. Maria dell' Anima). In October 2010, we had the honour of singing as Queen Eadgyth (910-946) was re-interred in Magdeburg Cathedral. If you would like further information about the choir or wish to be included on our mailing list to receive details of future events, please contact us.